Request an Evaluation Appointment Now! By submitting this form, I am requesting to receive additional information from Falls Church School of Ballet via email and/or phone. Registration is ongoing. 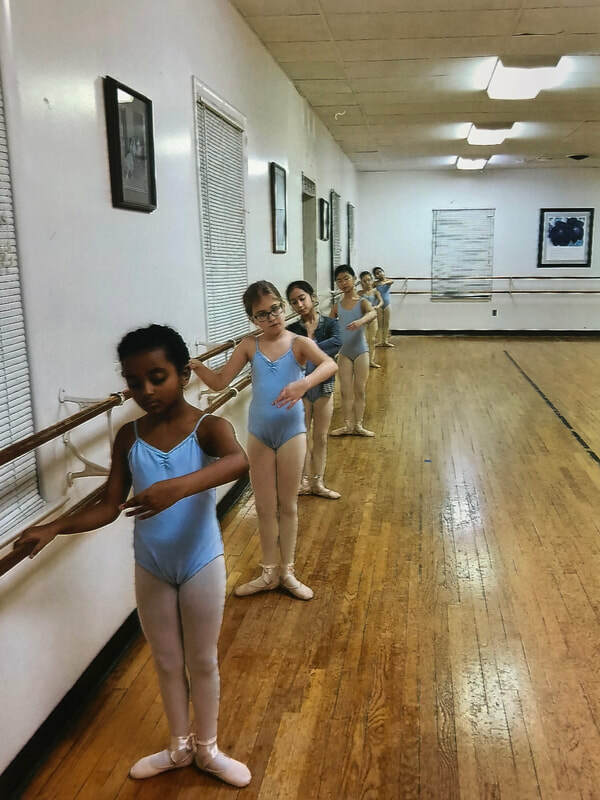 Those interested in enrolling in the Falls Church School of Ballet should call (703) 532-2221 or submit the form at the top of this page to make an appointment. The Falls Church School of Ballet uses the classical Russian ("Vaganova") method of teaching, which has, without question, produced the greatest dancers throughout history. The method is logical and complete, and even our beginning students possess rare qualities of professionalism. From Ballet I and up, pointe work and character dance are included in the curriculum. At the younger level, beginning at age 3, children are taught the protocol and discipline of classical ballet. Pre-Ballet programs include yogic stretching, ballet mime, and, later, beginning fundamentals. Other levels are determined by age and ability. In Ballet Prep, students are given preparatory exercises that are studied in greater detail in Ballet I. Beginning at the barre students will learn the correct stance, correct positions of the feet, and execution of movements in the most rudimentary form, along with steps that can be performed in the Kintz-Mejia Academy of Ballet (KMAB) productions. The Third Year, begins the study of center exercises on demi-pointe and movements en tournant (turning). There is also some acceleration of tempo. Here also begins the study of pirouettes and beats. Tuition includes all choreography and rehearsal fees. Students are required to purchase 10 tickets for each performance (Winter and Spring Concerts) at $25 each. There are NO REFUNDS, for any reason, once the tuition is paid and the student has begun classes. Falls Church School of Ballet (FCSB) is not responsible for missed classes. Should any class be cancelled by the school, students of FCSB are welcome to attend a make up class at Kintz-Mejia Academy of Ballet. 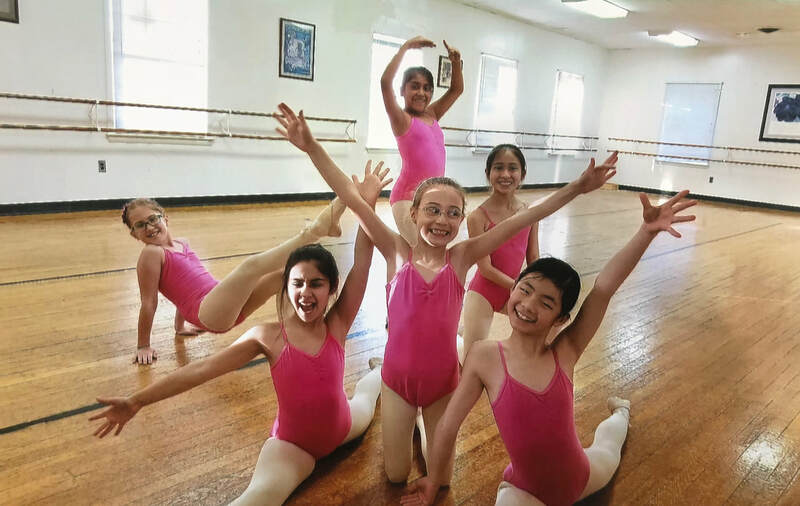 The Falls Church School of Ballet (FCSB) offers summer sessions through The Kintz-Mejia Academy of Ballet (KMAB) that are, in their own way, quite unique. Most schools use the summer as a cash cow to give children an activity that is dance-related and fun. Our school uses the summer months with other objectives. Students in Ballet Prep to Upper-Level Senior Division (or equivalent) are eligible. During the summer intensives, our students learn ballet history, vocabulary, and character dance. Often, our students attend the lower level sessions to reinforce their fundamentals. 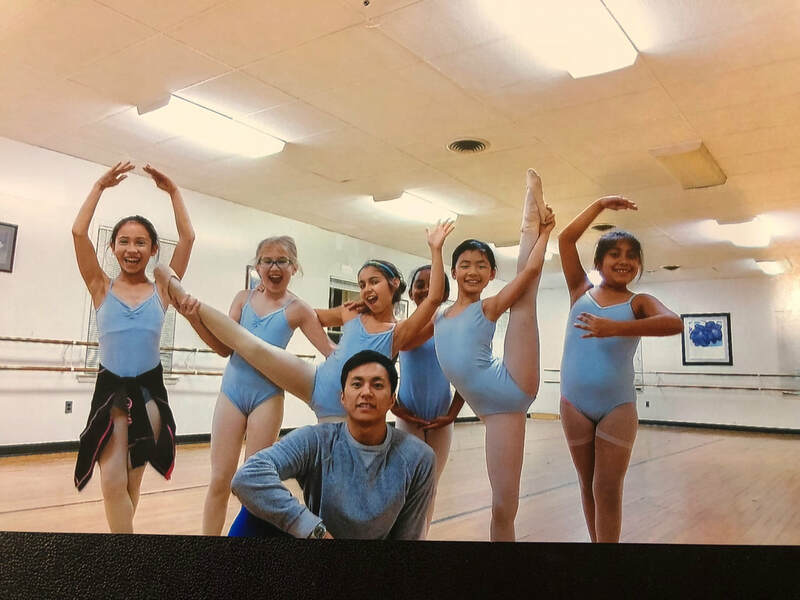 These programs generate tremendous technical dance growth, as well as provide an opportunity to focus on ballet much more intensely than during the normal school year. aA school uniform is required for all students at all levels. Ballet shoes tights, pointe shoes, and character shoes of the following designated brands can be purchased at dance stores. Uniforms may be purchased through the school for $30 each. Note: Beginning students should show their teacher all shoes before sewing elastics or altering the shoes in any way, in case they are incorrect and need to be returned. Note: A 10% discount is graciously provided to FCSB Students at ﻿The Cinnamon Tree (www.cinnamontreeva.com) in Herndon and at Footlights Dancewear in Alexandria and Silver Spring (MD). "So Danca" ballet shoes (pink) with pink elastics, white ankle socks with ruffles, and school-issued leotard. Pink canvas ballet shoes (Grishko) with pink ribbons; Prima Soft convertible tights (#101, European Pink) (no seams); and (for Ballet II and up only) Grishko 2007 pointe shoes (soft or medium shank). White (Grishko) ballet shoes with white elastics; school-issued white tank tee shirt; school-issued black ballet shorts; and white socks. Black canvas ballet shoes (Grishko); school-issued black tights; black character shoes; and white tank t-shirt. Students are expected to conduct themselves in a quiet, respectful manner at all times while at FCSB. Students are expected to be punctual. Students arriving late may, at the discretion of the teacher, be required to observe class if more than 10 minutes late. Students are expected to enter the class in their correct and unaltered uniform. With the exception of stud earrings, no jewelry is permitted. This includes adornments such as tattoos, false fingernails, etc. Girls in Pre-Ballet and up must have their hair in a low bun and sprayed. Students in lower levels are required to wear their hair tied back and secured off the face. Ponytails are unacceptable. The dressing rooms are only for changing and using the facilities. Students are asked to spend as little time in there as possible. Under no circumstances should students be called to class from the dressing room. Students who wish to arrive and depart in uniform should do so with some sort of cover-up. Class wear is not to be work as street-wear. No food or drinks in the studio or dressing room! The FCSB expects a call to let teachers know when a student is unable to attend class. The further in advance, the more appreciated. Parents bringing students for class should arrive no earlier than 10 minutes before class. Students should be picked up no later than 10 minutes after class or rehearsal. Under no circumstances should a parent enter a classroom while class is in session, unless invited to do so by a teacher or director. Please read all notices sent to you via email or with your child. Staying informed will make everyone's life easier. Parents with questions regarding any aspect of their child's needs and progress should make an appointment for a private discussion. Open conversations during class times are inappropriate and hinder the teacher from refocusing their attention on the next lesson. Parents may request a parent/teacher meeting at any time. Injury to students, or parents/siblings who might be waiting on the premises. Missing property left on the premises. Students waiting in the parking lot. Parents should instruct their children to remain inside the building until someone has come to collect them. Please use the various platforms for updates (email, website), with signup information on the FCSB webpage. As noted, the FCSB follows the Fairfax County Public School System for holiday (NOT teacher workshops) and inclement weather closures. Please watch the FCSB information platforms, local news channels, or, if needed, call FCSB to be sure when classes are cancelled.